Like all h-Class systems the hs-20’s inputs include analogue XLR, AES/EBU Digital (2 Channels) and Dante network audio streams. You can elect from each input and channel using SystemVUE software and it will auto fall over from digital to analogue for maximum reliability. We’ve housed all this rich, subwoofery-goodness in a rugged enclosure that’s manufactured from premium-grade, birch plywood with extensive joinery and internal bracing for resonant free operation. A highly-durable, 6-step Dura Coat finish looks great and protects the hs-20 through many years on the road. 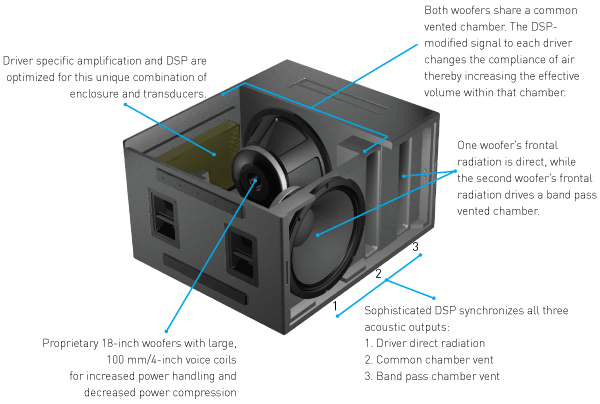 The hs-20 cabinet also comes with a 20 mm theaded insert for a speaker pole on both the top and side of the system.